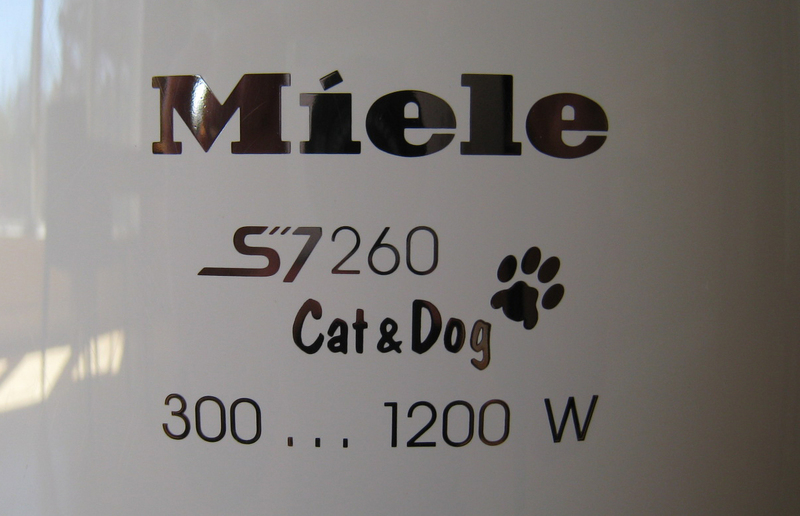 Yes, there really is a vacuum cleaner called the “Cat and Dog” and it’s made by Miele. A common question I get asked from dog owners is “what is the best vacuum cleaner?”. The answer is that there is no single “best” vacuum cleaner. People purchase a vacuum cleaner for many reasons and sometimes it has nothing to do with how well it cleans! Some people love their vacuum cleaner because it is lightweight and easy to carry up and down the stairs. Others like theirs because it is quiet or easy to empty. Vacuum cleaner maintenance will optimize function and longevity. The single most important maintenance procedure is to empty them often. Whether you have a bagless vacuum cleaner or one that requires a bag don’t wait until the bag or container is more than half full, empty or change it before then. I recently purchased the “Cat and Dog” and I love it. I selected this vacuum cleaner for a variety of reasons after reading reviews by Consumer Reports and homeowners on Amazon and elsewhere. It replaces a 15+ year old Miele canister vacuum cleaner. “Cat and Dog” is an upright vacuum cleaner. Most upright vacuum cleaners function better on carpet than hard surfaces but reviews suggested this one works equally well on both. My house is mostly hard surfaces with modular carpet in the living areas and circulation paths. The carpet was put there to help our Doberman move more easily through the space. So, I needed a vacuum cleaner that functioned well on both surfaces. The first time I used it on the carpeted stair landing I was impressed with how much dog hair and dirt it removed. I had no idea how dirty that landing was! 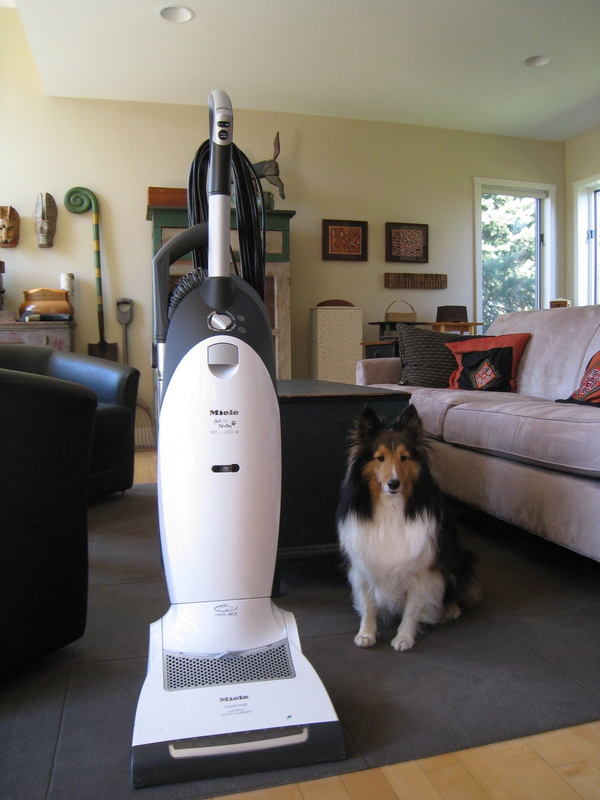 The “Cat and Dog” works smoothly, is relatively quiet, and has excellent variable power suction control. The swivel neck makes it extremely maneuverable. The automatic height adjustment helps when moving from one surface to another. An integrated hose with a “mini turbo” head is great for upholstery or carpeted stairs. The hose has good reach and suction as well. A 40 foot cord means I only have to plug it in once to reach most spaces on my first floor. One feature that I first thought silly is the integrated “headlight”. I was surprised at how well it helped me see in closets and other dark spaces. The “Cat and Dog” also has 3 options on filters that can be used. Mine came equipped with the Active Air Cleaner, which is an activated carbon filter to control odor. I will likely exchange it at some point for a HEPA filter that does a better job at controlling particulates that can exacerbate allergies. It also has an activated carbon filter in it to control odor. The main drawback to any Miele vacuum cleaner is the price. Miele’s are durable and durability equals longer life, longer life means better overall value. I’ve had other brands that lasted a fraction of the lifespan of my previous Miele. That one still functions, although the suction is diminished and some of the parts are beginning to break. More information on vacuum cleaners, cleaning and maintenance can be found in the book “There’s a Dog in the House”. This entry was posted in Interior Design, Products, Sustainable Design and tagged Activated carbon, cat vacuum cleaner, dog vacuum cleaner, HEPA, Miele, Pet vacuum cleaner, Vacuum cleaner. Bookmark the permalink. I have a pug and it shed hair like crazy. I’m now looking for the best vacuum cleaner that will make my life easier. I’m now divided between Miele and Dyson. I’ve heard many good stories about both. What do you think of the two? Do you think Miele is a better investment? I really love my Miele and have seen far too many Dysons tossed out by the side of the road! I actually have two Mieles, one is that nearly 20 years old and still works great. The only problems with it are some of the parts have broken off more from misuse and the cord re-winder does not work well anymore. I switched from a canister to an upright – the one in my blog and I am pleased with how that works on bare floors as well as carpet. I noticed that Bed Bath and Beyond are now selling Miele, so you could check there.